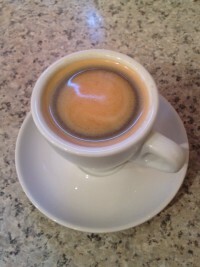 The morning of January 1st, 2015 started like any other morning, with an amazing cup of coffee. Silvia never fails to deliver on this, but the first cup of the year is extra delicious in the quiet of the morning. Sink into a comfy chair, take a sip, and the new year seems filled with possibilities. Last year Becky came across this great idea. I don’t know if it has an official name, but I like to call it a “Feel Good Jar”. This is the picture which she sent to me last year along with the suggestion that we start our own. The way it works is that every time something good happens, you write a small note, fold it up and drop it in the jar. 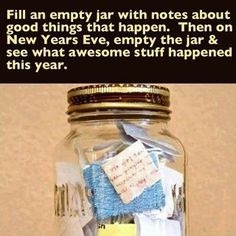 Then on New Years Eve or on New Years day you open the jar and read out all of the amazing things which happened to you over the year. Big things and small things. It’s unfortunate how we tend to forget the small everyday events which light us up, warm our hearts and feed our soul. Kind words from a friend or client at work might be remembered for a few days or a week, but 6 months later you might not remember. I know I won’t. I will definitely never remember the feelings surrounding the words. So when I write it down, I like to add my thoughts and feelings. It helps to bring back all the warm and fuzzy memories with it. Any great moment is worthy of adding to the jar. Becky and I have both been adding to it. What a way to spend some time on New Years day. Ok, we haven’t actually opening our Feel Good Jar, but one doesn’t want to rush such things. It should be fun and relaxing so why stick to an exact date. It will happen when it happens and not a minute sooner. I hope you all find a bit of time to look back over some of your fond memories of the past year…and think about all the possibilities of the coming year. May your jar get filled to the brim! PS – I forgot to mention who Silvia is. She’s a model…..well, let me rephrase that……Silvia is the model of espresso maker we have. Made by Rancilio. Those Italians!